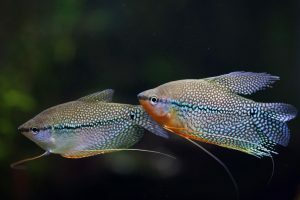 The Pearl Gourami (Trichopodus leerii), also known as the mosaic gourami and lace gourami, is widely known as being one of the easiest gouramis to care for. It is native to Malaysia, Sumatra, Borneo and Thailand, though its population appears to be on the decline in recent years. In the wild, it is primarily found in lowland swamps and coastal waterways and is most at home in heavily vegetated and shaded areas. Most of the waters it inhabits are acidic, but since the vast majority are now bred and raised on fish farms, they can tolerate a wider range of water types than wild caught fish could in the past. Pearl Gouramis stay relatively small in the home aquarium, and most will only grow to a maximum of 5 inches. The males are distinctive from the females, and they exhibit bright orange coloring around the throat region, which becomes more brilliant during breeding. Most will only live between 4-5 years in the home aquarium, though some exceptionally well cared for individuals have reached 8 or even 9 years of age. 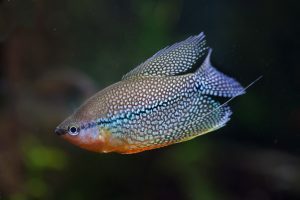 Pearl Gouramis have a well earned reputation as a hardy fish, and are undemanding when it comes to aquarium requirements. With that being said, they can exhibit signs of stress if they are kept in conditions that are too cramped for them. When considering a tank purely for a small group of pearl gouramis, a 20 gallon aquarium should really be viewed as the minimum size. Tank mates for pearl gouramis should be chosen with care, and any overly active or aggressive fish should be avoided. They tend to be peaceful and timid fish, so they will do well with most slow moving community fish. Because of this and their hardy nature, they are often seen in larger community tanks and are highly sought after. Any tank containing pearl gouramis should be heavily planted, and the fish will also appreciate subdued lighting and a dark colored substrate. The subdued lighting does not necessarily mean that you have to cut back on the tanks lighting, and can be achieved through a combination of floating plants and tall aquatic plants. I would strongly recommend choosing an Aquaclear Power Filter for a pearl gourami tank. This filter combines excellent filtration with a durable design, and it will keep your tank sparkling clear for years to come. You can also read the Aquarium Tidings Aquaclear Filter Review here. If you have a bit deeper pockets, you may also want to consider using a canister filter, though for pearl gouramis it tends to be overkill. Some people also use sponge filters in conjunction with HOB filters, which helps to provide the excellent water quality that tends to prevent disease in pearl gouramis. Pearl gouramis are ominvores, and consumer plant matter, algae, inveterbrates and worms in the wild. This diet should be replicated as closely as possible in the home aquarium, and can be accomplished through regular feedings of a high quality flake food, live or frozen foods and varied offerings of vegetables. I personally use Hikari Micro Wafers which is among the best prepared foods that you can feed to your fish. Some of the easiest live foods to provide are brine shrimp, black worms, mosquito larvae (illegal to culture in some areas) and daphnia. If you can’t provide them with live foods, then frozen foods are almost as good, and they will greedily accept frozen brine shrimp, blood worms, daphnia and blackworms. The vegetables that are most readily accepted by them are blanched zucchini and cucumber medallions, shelled peas and some people have reported success with lettuce and spinach, though I’ve never had success with my offerings. Breeding pearl gouramis is relatively easy, and will often occur with very little intervention. As with many fish, it’s important to first condition the fish for breeding through regular feedings of live or frozen foods. After about a week of this conditioning, most pearl gouramis will be ready for breeding. As previously stated, sexing your pearl gouramis will be simple, as the males have a bright orange stripe around their neck, which will brighten coinsiderably during breeding. The females will not have the orange stripe, and will also be noticeably plumper than the males as they fill up with eggs. To prepare their aquarium for breeding, the temperature should be raised to 80 degrees and numerous floating plants should be provided. Pearl gouramis are bubblenest builders, and will often use floating plants in the construction of their nests. Once breeding commences, the male will entice the female under his bubblenest, where he will wrap his body around hers as she lays the eggs. The male will catch the eggs as they begin to sink, and will place them in the bubblenest, one by one. Mating may occur each time, and the male will place the eggs in the bubblenest after each mating. After mating is complete, the male will set about guarding the bubblenest, and you may want to remove the female at this point. After around 3 days, the eggs will have hatched, and the fry will start to become free swimming. The male should be removed at this point, and attention should be given to feeding the fry. about two months ago i had a Pearl Gourami and as soon as I got it, it was attacking my guppies, hachet fish, my chiese algae eater, even my plecos! this happed for about a week, then it was dead one morning. not sure what happed there. That’s definitely weird, as these fish are pretty peaceful for the most part. Were any of the other fish chasing it? And how big is your tank again? These aren’t too bad a choice, though they can be aggressive at times. But I know a fair number of people who have kept them together successfully. Hey Rob are Pearl Gouramis and Dwarf Gouramis compatible? They are in larger tanks, though I’ve seen the dwarfs sometimes become aggressive towards the pearls. Just make sure there are plenty of tanks and hiding places, and they should be fine together. At what size do they start to breed? Usually around 2 inches, but it’s variable on what they’re fed and the conditions in the tank. What sort of aggression are you experiencing, and with what species of fish? Once daily is fine to feed pearl gouramis. Feed them as much as they can eat in five minutes, and they’ll do well.